Growing Stevia Information : How To grow Stevia? Details on how to grow stevia plant in pots starting from seeds or cuttings are given including its care information. I am growing stevia in a pot in Sydney, Australia for the last 10 years. Stevia (Stevia rebaudiana Bertoni) is a herb that is a great natural sweetener with zero calories. It belongs to the sunflower family of plants. It is native to Paraguay and other tropical areas of the South Americas. It is an all-natural sugar substitute, about 300 times sweeter than sugar. The plant Stevia has been grown and used for more than 1,500 years in South America. The leaves have been used traditionally for hundreds of years in Brazil and Paraguay in teas and medicines. Growing stevia is very easy. Stevia is an easy to grow plant needing very little care. It grows well in most part of Australia. 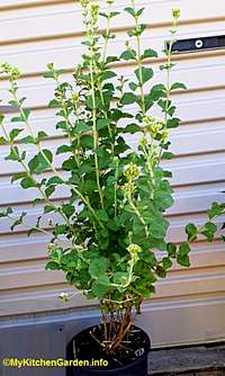 You can grow stevia plant outdoors in garden bed or indoors in pots. If live in an apartment, you can plant stevia in pots in your balcony. Choose a container of about 10-12 inch diameter having a number of drainage holes at the bottom. The pot need not be very deep as the stevia roots are shallow. 3 to 5 stevia plants can meet your give you a year's supply of dried stevia leaves. Position : Where To Plant Stevia? Stevia grows best in full sun. If you don't have full sun, place the pot where morning sun is available. In extremely hot summers, move the pot in the afternoon shade. In very hot summers, place the plant in shade in afternoon. Although stevia can be started from seeds, but it is best to grow from rooted cuttings. Buy a small stevia plant from your local garden centre, look in the herbs section. Stevia grows well in a rich loamy and well draining soil or even in general purpose garden soil. Stevia will not grow in salty soils. Add some coarse river sand in the potting soil to make it free-draining. needs frequent shallow watering. But note that excessive moisture or over-watering can adversely affect the growth. The plant will be benefited by putting a layer of compost or mulch on the plant, specifically for pots. Generally, if the stem tips of your stevia begin drooping, it is time to water. In the first year of my stevia plant, I did not prune the leaves, so it grew into a tall plant with 7- 8 branches. It produced tiny white flowers in late summer. When the plant is about 8-10 inch tall, trim the tips of the branches to induce branching to maximize leaf production. The stevia plant has low nutrient requirements. I usually feed with a balanced liquid fertilizer every 3rd week. The stevia plant is relatively free from any pests attack and diseases. The stevia plant has insect-repelling properties. Their natural sweetness is a natural deterrence to aphids and grasshoppers that find it not to their taste. The quality and quantity of stevia leaves are best just prior to flowering of the plant. The cool autumn temperatures and shorter days increases the sweetness of the plant. Generally you can start harvesting when plants are 40-60 cm in height. Once you harvest all the leaves, put them under full sun for 12 hours to dry. You can store dried stevia leaves in an airtight container in a cool dark place. To release the stevia’s sweetening power, crush the leaves either by hand or in a coffee grinder.